(0 Customer Reviews) | Write Review 10 issues per year Easy Cook is designed to appeal to people who want to get good, healthy food on the table every night but quickly and without any fuss. In every issue and on every page Easy Cook shows readers how it is possible to cook from scratch using fresh ingredients – without spending hours in the kitchen. We always use clear, straight-forward, easy to understand language in our recipes so that having a copy of Easy Cook to hand while cooking is like having a good friend with you in the kitchen. SPEEDY MEALS is where you’ll find a whole range of quick and easy recipes, all ready and on the table in 30 minutes or less. 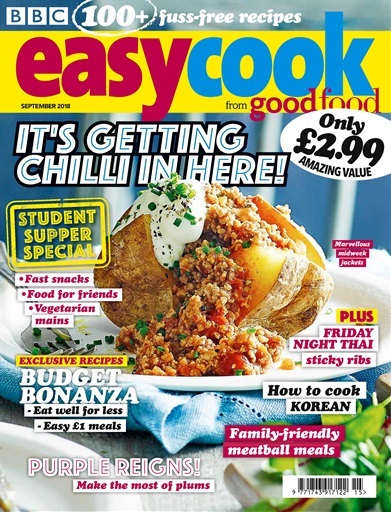 You'll receive 10 issues during a 1 year Easy Cook magazine subscription. You'll receive 10 issues during a 1 year Easy Cook magazine print subscription.